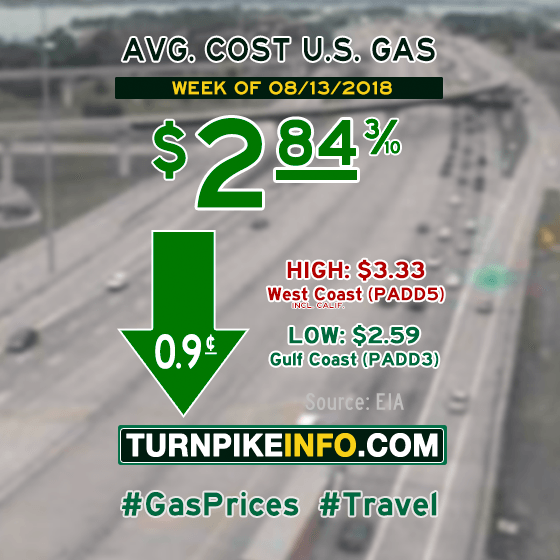 Fort Lauderdale, FL – The national average cost of gas dropped about a penny per gallon during the past week, according to the latest weekly fuel price survey from the U.S. Energy Information Administration. The weekly E.I.A. report shows the nation’s average gas price, for regular unleaded, is now about $2.84 per gallon. The Midwest led the nation in overall regional price declines, where the average cost for gas dipped well over two cents per gallon. Midwest price declines were highest across Ohio, where the average price per gallon plunged over ten cents. Meanwhile, drivers across the Lower Atlantic and Rocky Mountain states were hit with the most noticeable price increases, according to the E.I.A. The cost of diesel was moderately lower in all regions this week, helping lead the national average cost of diesel down a little more than a half-penny per gallon. The E.I.A. reports the national average cost of diesel is now about $3.22 per gallon. This week’s average fuel prices for all regions are shown below, as gathered from www.eia.gov.